Welcome to the Stanford AIA Society and its website! 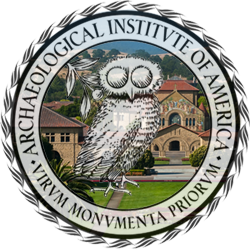 The Archaeological Institute of America (AIA) is the world’s largest archaeological organization, made up of members numbering over 200,000 professional archaeologists, graduate and undergraduate students, educators, librarians, archaeology volunteers, museum professionals, interested community members and corresponding international members who are passionately interested in the human past and ancient cultures. The AIA can be found in over 100 regional societies across North America; many, like our society, connected to and or convening in university or collegial institutions and enjoying the academic benefits thereof, in our case stimulated by the enormous intellectual amenities Stanford offers in the heart and birthplace of Silicon Valley. We are all dedicated to preserving the past, whether by scientific excavations, education, and conservation of material and cultural history. Some of us teach in universities and colleges and conduct ongoing fieldwork, the rest support this pioneering research through society lectures and donations. Many of our members – even those who are not professional archaeologists — actively engage in regular archaeological fieldwork and all of us believe understanding the past is key to the present and the future. We know the future generations will be grateful for our dedication to broadening the understanding of what it means to be civilized: respecting and preserving the human past and its enormous legacy through countless millennia. We are committed to ethical practices for historical preservation and representation of ancient and indigenous societies. Our passion for history includes both an awareness and promotion of keeping original material culture as much as possible in the hands of regions and peoples where it began, thus while we work closely with museums, we absolutely discourage looting of sites and collecting material from unprovenanced sources and believe sensible repatriation of materials can be a positive experience for cultural diplomacy. We hope you will join us in this exciting and challenging adventure of reconstructing human history and prehistory in many ways, especially by attending our society lectures and events and by joining the larger national AIA organization, which is a great bargain and provides either a full color international magazine or academic journal to members and trips to historic sites around the world and promises an ever-widening informative awareness of global archaeology on the very frontiers of discovery. Let us help bring the ancient world to your doorstep!